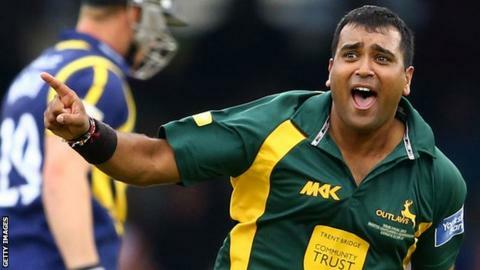 Soon-to-depart Glamorgan coach Matthew Mott said his side never recovered from losing three wickets in nine balls to Samit Patel in the YB40 final. The Welsh county lost by 87 runs with Patel taking 3-21 in seven overs. "When he came on we did have some sort of rhythm going and ascendancy, and he took it away from us and we never really got it back," said Mott. Patel's spell reduced Glamorgan from 108-2 to 118-5 and they were eventually dismissed for 157 in 33 overs. Australian Mott, who leaves Glamorgan at the end of the season after three years in charge, also conceded that Gareth Rees dropping a difficult chance from David Hussey during Nottinghamshire's innings was another key incident. Notts were toiling at 98-4 when a diving Rees failed to hold on to a sharp chance at mid-off. Australian Hussey went on to share a stand of 99 off 93 deliveries with Chris Read as Nottinghamshire posted a formidable total of 244-8. The people who are in charge at the moment are going to steer this club [Glamorgan] in the right direction and I'm really excited to follow it from a distance. "They're the things that happen in finals," admitted Mott. "It wasn't an easy chance, but it's one that he would expect to take normally and it was key in the end. "From that point on they built nicely and we were lucky enough to get Hussey when he was looking really dangerous. "But that total was always gettable, but probably 20 or 30 more than we were expecting to chase at one stage in the innings." Jim Allenby and Chris Cooke's 66-run partnership briefly gave the Welsh county a glimmer of hope before man-of-the-match Patel's interjection. "Allenby and Cooke played extremely well," said Mott. "And they didn't throw their wickets away, they were bowled out by Patel and that was the difference in the end - it was that partnership that was going to win us the game and unfortunately we didn't take it today." Although the Queenslander will not be part of Glamorgan's set-up next season, he believes the county's first visit to Lord's for a final since 2000 does mark a significant chance in their fortunes. "We made a commitment that win, lose or draw, this game would be a real starting point for this squad," added Mott. "I draw a lot of joy out of that and I think the people who are in charge at the moment are going to steer this club in the right direction and I'm really excited to follow it from a distance."